Put on your pants as we’ve got company! Developer Liam Hill joins us for a chat about the week’s goings on. From the future of AAA development to the future of Saints Row’s T&A, hoes and foes, Kickstarters that have a really excited and the scariest game we’ve seen all month. Ben also talks about cookies. The PS4 is fuelled by dreams and magical rainbows. While we may never again be able to play in our grundies again under the watchful eye of Big Console everything is new again and that makes us feel good. Also if we find time we’ll discuss some other games and our regular rubbish! Today we saw what was possibly the most exciting presentation on the future of gaming I have ever seen. 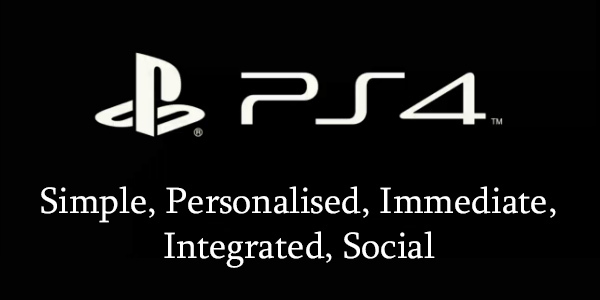 The Playstation 4 was revealed but more importantly Sony put forward a message of expanding the gamer experience but keeping games at the core. PS4 Meeting rundown after the jump.